The natural fiber ribbon display chez Ultramod's, is not only a feast for the eyes, but also a great source of inspiration. Seeing so many colors together, allows you to try out endless color combinations in a fun and easy way..
.. and felt like adapting it for summer, by changing the beige/grey cotton pants for a crisp pair of white jeans, and knotting the Gavroche into a cool and breezy cowboy knot. Shoes and the rest of the accessories in a cool, dark brown, to frame the look and tie all elements together. Scarf tying method: Fold scarf into a tritangle, place around neck 'bib style, knot both ends into a double knot behind your neck. Another beautiful and very summery look, MaiTai. While the page was downloading, the only pic I could see was the zoom on the yellow and purple ribbons and it reminded me of your new cent plis! Wonderful association of colors. I love the horn cuff. I thought it was from your collection but then couldn't find it on the page. Was I too fast? Or wrong? Thank you for teaching us how to mix colours and with tiny differences create totally different looks! Purple and yellow go so well together! And the way you folded the gavroche is perfect for warm summer days. Hug to you. It is always great to see you stopping by, dear Faux Fuchsia, and I just love your blog! Dear DD, counting the days with you! Re the book, I have good news for you, you can get a copy at WH Smiths in Paris, rue de Rivoli no 248, just off the Place de la Concorde. Looking forward to seeing you soon too, and woohoo, very excited about the buffa**!! Dear Penney, happy you like the look, and thank you for saying so, that is so sweet of you. Have a great week too! What an easy breezy summer look.So chic and effortless...so MT! The Brazil II gavroche is a fav of mine and I love seeing it tied in the easy cowboy Knot.Great fun it was being able to "travel" with you to Paris to browse the beautiful candy store of ribbons! Thank you for taking us all along and sharing the inspiration. This may be a double-comment. If so, I apologize, but my first one seems to have been lost. I was just given my very first Hermes scarf (astrologie in red) and I'm hooked now. I came across your site while surfing for tips on how to wear my new scarf. 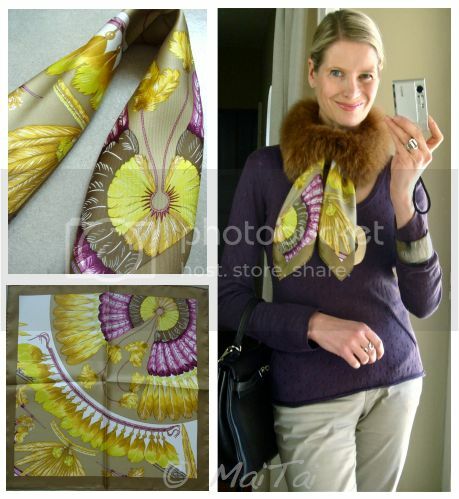 I must say, you are truly inspiring: such style, such beautiful scarves and such great, great tips. Thank you so much - I'll be a regular reader from now on. I have a question for you though: how do you clean your scarves? do you dryclean or handwash? There seems to be some discussion on which way is better for the scarves. Any insight would be appreciated. Please put my name on the list for the horn cuff BEFORE they sell out!! Magnificent this transition from early spring to summer. And really magnificent the transition of the cherries from the market to this placid place in the penumbra of your kitchen, framed by a rose. Thank you very much for your extremely elegant blog, full of refined sensibility and sharp intelligence. I'm catching up on everything - love the last posts! I happen to have an antique cake stand collection... perhaps I can serve you a slice of Gugelhopf? How I love the Brazil II gavroche - I still have one in an orange box, waiting to be unpacked when my days are less hectic! Dear Mette, a warm welcome to the ‘orange silk road’, and to my blog. Congratulations on your first Hermès scarf, the Astrologie is such a beautiful classic, a perfect first scarf to start your collection with! Wishing you a wonderful journey collecting and wearing your silks. As for cleaning scarves, I generally hand wash my silks (except Plissés, as the pleats would come out). Dry-cleaning apparently weakens the silk over time (unless you have a top dry cleaner, who does not use PERT), and if you are really unlucky, the hand rolled hems get ironed over, and flattened in the process. Very occasionally, I do take a scarf to the dry cleaner, for example if there is a difficult stain on a very light scarf. I would hand wash the scarf afterwards though, to get it to smell nicely again. MaiTai, I hope you and your family are safe after the floods in France, I saw the images and went immediately worried about you. Big kiss from Arizona. Another beautiful look, so radiant and impeccable, I love it (can't wait for the cuff). Would love to see another outfit with the Cent Plis.